On that note, I can think of no better way for me to start my year than by opening next the round of Hay Hay it’s Donna Day! As I have mentioned before, I am quite the Donna Hay fan, and subsequently, HHDD is one of my absolute favorite blog-events (thank you Barbara for creating it!). So, as you can imagine, I was beyond thrilled to have won the last round and to host this one. – Place the yeast, sugar, and water in a bowl. Set aside until bubbles form. – Add the four, salt, and oil, and mix to form a smooth dough. Knead for 10 minutes or until smooth and elastic. – Place in a clean, oiled bowl, cover, and allow to stand in a warm place until it has doubled in size (Donna says about 20 minutes, but mine took longer). Makes one quantity. – Preheat the oven to 220 C (425 F). Place flat baking trays in the oven to heat (I used my pizza stone!). – Divide the dough into four (I made three instead). – Roll out to 2-3 mm thick on a sheet of non-stick baking paper dusted with semolina. 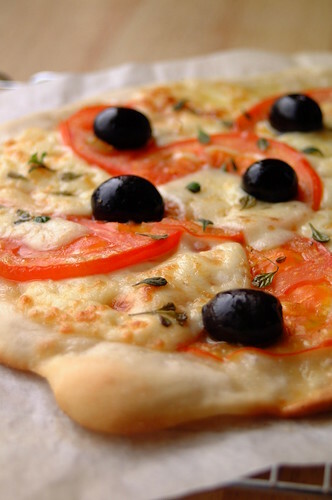 – Top each pizza base with some tomato slices, oregano, mozzarella, and olives. Drizzle over some oil. – Lift the baking paper and pizza onto the preheated trays. 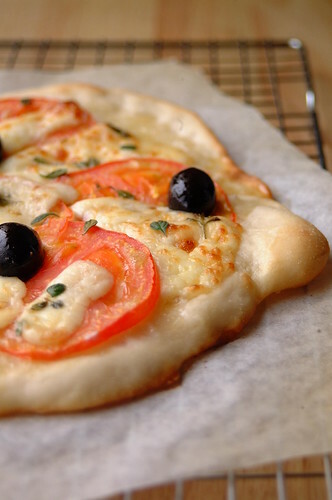 – Bake each pizza for 15 minutes or until golden and crisp. And don’t think that all pizzas should be savory…I would love to see some sweet pizzas too! – Hay Hay Its Donna Day is open to all food and wine bloggers. – Entries submitted for HHDD must be made specifically for this event, although photos may be submitted to Does My Blog Look Good In This. – The host will select, make and post the original Donna Hay recipe without any changes. Participants may make the same recipe as is, or put their own spin on the recipe by altering the ingredients whilst remaining with the theme. – Entrants should include a link to the host in their post. – Entries can be made at any time once the event has been announced but must be posted and emailed to the host by the closing date. – Deadline for all posts to be up and submitted is January 26, 2008. I will be posting the round up a week later (February 2) and voting will begin then! – You can email all your entries to eighty_breakfasts(AT)yahoo(DOT)com on or before January 26, 2008. In your email, please include the following information: your blog name, your name, your location, your recipe name, and the permalink to your entry. – The winner with receive a food related prize care of yours truly!